For the Oct. 2014 Photo Assignment, TDS shooters got their feet wet. See for yourself in our gallery, Water. And which one will be the SizzlPix Pick of the Month? Photo by Glenn Hubbers. 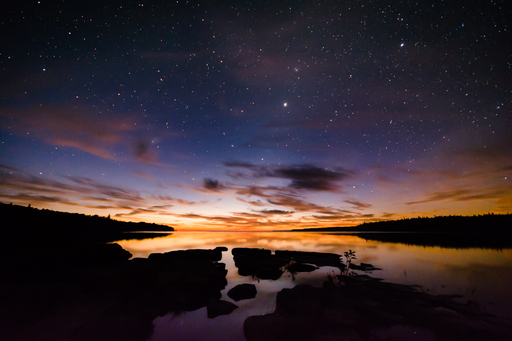 Glenn writes, "I took this shot at sunrise after being out for half the night trying my hand at astrophotography. Despite going out to capture star trails, (which was a failure that will need more practice!) I decided to hang out to see the sunrise. After all was said and done, I thought this shot was the best of the trip. I had travelled for the weekend up to Tobermory, Ontario to get away from light pollution. It was a great trip, just me and my camera kit hanging out for the weekend." See all of the great images from this month's assignment by visiting the gallery, Water. The Dec. 2014 assignment is "Frozen." Details can be found on the Member Participation page. Deadline is Dec. 31, 2014. No limit on image size submitted. Please follow the instructions carefully for labeling the subject line of the email for your submission. It's easy to lose these in the pile of mail if not labeled correctly. For example, the subject line for this month's assignment should be: "Photo Assignment: Dec. 2014." Also, if you can, please don't strip out the metadata. And feel free to add any IPTC data you wish (These fields in particular: Caption, Credit, Copyright, Byline), I use that for the caption info. Gallery posting is one month behind the deadline. So I'm posting Oct. 2014 gallery at the end of Nov., the Nov. gallery will be posted at the end of Dec., and on and on.